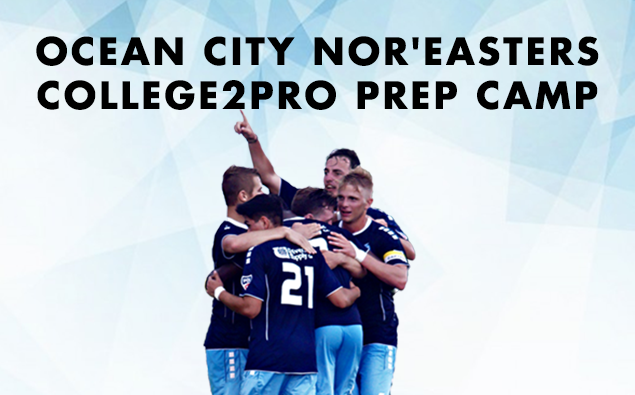 The Ocean City Nor'easters have been helping college players on its Premier Development League roster make the jump to the professional game for nearly 15 years. Now, the Nor'easters want to offer this guidance and knowledge to players through the Ocean City Nor'easters College2Pro Prep Camp. Nor'easters Sporting Director Tim Oswald and Technical Director David Castellanos will lead the camp which will run from July 31 - Aug. 4. Since 2012, as head coaches in the PDL (Oswald with Ocean City Nor'easters, Castellanos with Reading United AC and Lehigh Valley United) they have had 48 players move on to sign professional contacts, including 25 of those who were selected in the MLS SuperDraft. The sessions will feature special guests that will be announced at a later date. The goal of the College2Pro Prep Camp (#College2Pro) is to provide the highest level of training and mental preparation possible. Each session will be competitive, mirroring an actual professional training environment. Each day will have a specific training theme, covering the major concepts of the game. In addition to the competitive training there will be invited guests throughout the week to help motivate and encourage players individually as they work toward their soccer goals. "We wanted to create a professional training environment for high school seniors and college athletes preparing for the fall season at an affordable price point," said Nor'easters Sporting Director Tim Oswald. "As we create enhanced relationships with players that want to get into our club network, the prep camp is the ideal setting to catch our eye while pushing the envelope on their progression as a player. All players want to play at the highest platform possible and our structure as an organization has proven that opportunities are there to play at the next level." The camp will also serve as a recruiting tool for the club as the Nor'easters will be on the lookout for talented players to join the Under-20, Under-23 and PDL rosters for the 2018 season. Players can choose which session works best for their schedule, a morning session (Camp 1) or an evening session (Camp 2). Camp: 10 a.m. - 12 p.m.
Seminar: 12 p.m. - 1 p.m.
Seminar: 5 p.m. - 6 p.m.
Camp: 6 p.m. - 8 p.m. This is an excellent opportunity for any player who will be in a high school senior in 2017 or is a current college player at any level. Players can sign up and take advantage of the opportunity for just $150. Each player who registers will receive one season pass for the either the 2017 or 2018 PDL season. Initially, the camp was just open to high school graduates, but due to popular demand, the Nor'easters are now offering it to players who will be high school seniors in the fall of 2017. "After attending a few college showcase events and scouting some of the very best Under-17 and Under-19 teams in the country, many parents were thrilled that we were offering the College2Pro camp, but players entering their senior year in the fall of 2017 were disappointed that they had to wait a year to attend," said Oswald. 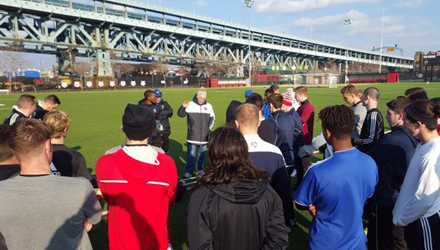 "Our staff decided as we looked to build out our Under-20, Under-23 and PDL rosters for the 2018 season, we wanted to extend that invitation to the players that want to train in a professional setting with other collegiate players attending. This will really give them a bar to shoot for as they get to play with players at every level of college soccer and allow the staff to spend an extended amount of time with these players that are also looking to play within our club. "The feedback, structure, and uniqueness of the camp has really caught fire among the college coaches and players in the area," he added. "We essentially are serving a market of players that need this advanced preparation prior to the preseason, outside of offering guest speakers that coach at the MLS and USL level and play at the professional level, we are so excited to be offering this opportunity through the Ocean City Nor'easters organization." The Nor'easters were established in 1997 as a professional team, but joined the Premier Development League (PDL) in 2003. The PDL is the top amateur league in North America, fielding 72 teams across the continent in 2017. Since joining the league, the Nor'easters have seen more than 60 former players move on to sign professional contracts both in North America and around the world. 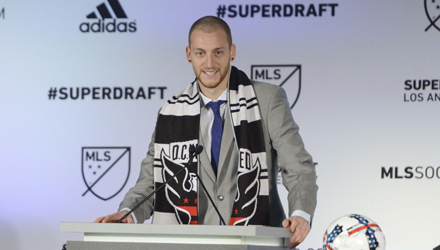 22 of those players have been drafted by Major League Soccer teams, including 10 of them within the last three years. 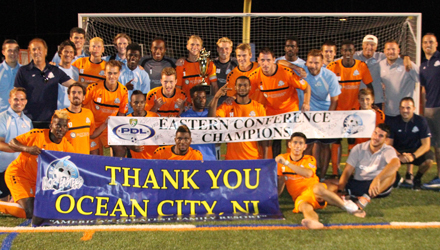 Since 2003, Ocean City has the sixth-best record, and boasts the sixth-best home record in the PDL. They have won two Eastern Conference championships, which have resulted in two PDL Final Four appearances, three division titles and have qualified for the playoffs six times in one of the most competitive divisions in the league. The Nor'easters have also made a name for themselves on the national stage as a giant-killer in the Lamar Hunt U.S. Open Cup, the United States' national championship modeled after England's FA Cup. The U.S. Open Cup is a single-elimination March Madness-style tournament that puts amateur and professional teams on the same field. The Nor'easters have upset five professional teams, something only two other amateur teams in the country have achieved.